It is now over 20 years since Robert Kaplan and David Norton published their revolutionary views on how performance measurement systems must change to embrace the demands of a future environment in the Harvard Business Review (see “References and Suggested Reading” at the end of this briefing). The Balanced Scorecard is now accepted by many organisations as a tool that has reinvented the way that information is gathered, decisions are made and strategy is implemented. It is reported that over 50% of Fortune 1000 firms now use the scorecard concept. I have helped to implement the Balanced Scorecard and found that it has acted as a catalyst to assist staff at all levels in an organisation to see their jobs and the outside world from a totally new and more dynamic perspective. Above all, the Balanced Scorecard concept provides an excellent foundation for organisations to design their management information systems. – Implementation. What are the problems and potential pitfalls when building a Balanced Scorecard for the first time? – Sustaining success. What are the downsides that long-term users of the Balanced Scorecard must avoid? This area in particular has received little attention and warrants investigation. I will start by providing a brief refresher of the Balanced Scorecard concept itself and then look more closely at the above two questions. 1. Outcome focus. Established financial indicators such as turnover and profit before tax are outcome indicators. They only alert us when things have gone wrong and the effect is being felt in the balance sheet. Such indicators and measures don’t provide us with an indication of when things may go right or wrong in the future. In short, these measures are lagging not leading indicators – they do not provide us with an early warning system. 2. The drivers of business success. Financial measures alone do not assess and measure the parts of the organisation that create the customer value that in turn delivers profit. A more holistic approach is needed that helps managers – like physicians – to examine the state of health of the entire body corporate. 3. Strategy into action. I have raised this failing in earlier briefings. Many business plans paint favourable future financial returns but don’t explain explicitly what must be done to achieve the planned returns. A well-managed scorecard project will identify and measure the key activities needed to deliver planned performance. 4. Strategic communication, involvement and ownership. Traditional, financially based plans are difficult to communicate across the organisation. I always remember, when I was a manager, giving a presentation looking at the future objectives of my company and at the end someone put their hand up and said “Excuse me, but what does the word ROCE mean?” I had forgotten that ROCE (return on capital employed) was a technical term used by very few people in the company. The fact is that most business strategies are not communicated in ways everyone can understand. A well constructed scorecard is an effective communication vehicle. Attainment of financial objectives – growth, lower costs and above all increases in shareholder value is driven by other dimensions or perspectives in the organisation. It all starts at the bottom in the “Learning and Growth” perspective. Skills, culture, leaders and management information that are aligned to the organisation’s strategy will create effective and efficient business processes – as shown in the “Business Process” perspective. Effective and efficient product delivery, customer relationship, innovation, regulatory and environmental processes in turn make sure that the organisation’s offerings meet and exceed the needs of customers. The components of the organisation’s offerings to its customers (products, services relationships and brand) are shown in the Customer perspective. Satisfied customers and efficient business processes combine to produce growth, lower costs and better use of the organisation’s capital – the result being increase in shareholder value. – Holistic – all critical areas in the organisation that produce financial outcomes are assessed. In addition to the financial dimension, we have the three key parts of the organisation that inter-lock to deliver shareholder value. – Forward looking – failure to meet say, skill acquisition targets, is a leading indicator of future failure in processes, customer satisfaction and ultimately, profits. – Easy to communicate – strategy can be easily explained and communicated. The illustration above is the basis for a strategy map – a series of initiatives that must be completed to achieve the objectives in the organisation’s business plan. A simple and visual way of communicating what the organisation plans to do to meet its financial objectives. 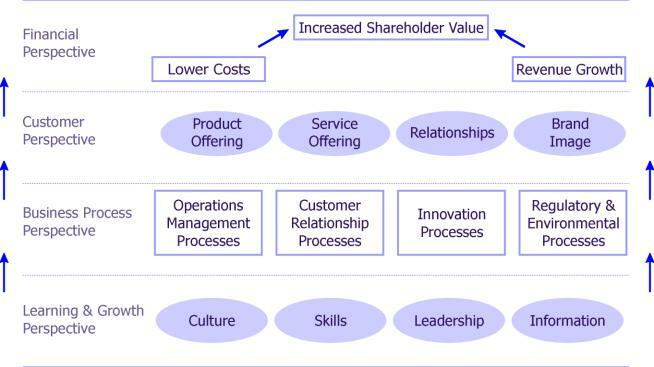 – Based on measuring four key dimensions – Learning and Growth (people, skills, culture, leadership and information), Business Processes (embracing four processes – product delivery, customer relationships, innovation and adherence to regulatory and broader environmental needs), Customer Offerings and Relationships and finally Financial embracing key financial objectives. – Ill-defined strategy. The success of any scorecard project is determined by how well your organisation has worked through and defined its strategy. Broadly, an ill-defined strategy produces a vacuous and confusing scorecard. You must either have worked through the strategy process (as summarised in my briefing Its Strategy Time Again 2 ) or you must incorporate a strategy building element right at beginning of your Balanced Scorecard project. Failure to define and articulate a clear strategy will lead to an ambiguous and confused scorecard – and importantly one that lacks the thread of strategic consistency as the scorecard process is rolled out across all areas and functions in the organisation. – Management style. Some readers may remember another process for guiding the organisation to strategic success – Management by Objectives (MBO). MBO was consigned to the recycle bin of failed management panaceas over 25 years ago. The major reason for its failure was an issue of management style. Remember that the Balanced Scorecard is not (i) a tool for imposing a strategy created at the top of the organisation or (ii) a stick to beat people with. It is actually a tool to allow people to both participate in the strategy process and create objectives and measures that reflect their business area’s efforts to support the broader corporate strategy. MBO failed due to a highly centralised top-down style. – The paper chase. Remember that the Balanced Scorecard will create a need for information that cannot be sourced from existing financial information systems. This is both a strength and a weakness. It is a strength, as it is part of a process for building a more holistic performance management system that includes new areas such as the People and Learning dimension. It is a weakness, as a laborious paper based system can be created. The extra time needed to build a paper-based scorecard can demotivate staff. My answer is twofold. Firstly, make it as simple as possible for staff to build the scorecard and secondly, make it easy for staff to drill down and see the true causes of adverse or positive performance revealed by the scorecard measures. I usually start by helping a business unit to build an Excel model that produces the scorecard with minimal user intervention, by drawing in data in Excel format from disparate systems across the organisation. The model also allows users to quickly drill down and see where the real issues are. Far from being a paper chase it is a hands-on problem solving tool. And being a problem solving tool helps gain acceptance. – Centralised measures. One of the major benefits of the Balanced Scorecard is that it helps staff understand, develop and apply strategy within their business units. Do give staff the freedom to develop their own objectives and measures in addition to common, centrally defined objectives and measures. Do make sure that all areas in your organisation are involved. – Lack of integration. The Balanced Scorecard isn’t another stand-alone project or system. It is the performance management and monitoring system, integrating typically a range of disparate systems, measures and monitoring approaches. – Ignoring conceptual issues. Don’t try to get one generic scorecard to fit the entire organisation. Each organisation’s scorecard will be different. Key differences include industry, strategy and organisational structure. Ensure that staff really do understand how the scorecard works and how it will benefit them. – Excluding stakeholders. Don’t implement the concept in one or two Head Office areas only for example. To work, you must build a hierarchy of scorecards, reflecting the structure of your organisation and how it adds value to the customer. Remember that over a decade has passed since the scorecard concept was first developed. Outsourcing and offshoring are now commonplace – ensure that these value generating operations are included too. So, these are some of the key issues to consider when implementing a Balanced Scorecard project for the first time, but what of the issues for established users? Are there issues for established users? Yes. Obviously, the issues raised above also apply, but there are several problems that are unique to established scorecard systems. These are shown together with the implementation issues already discussed in the next illustration. Looking at this illustration, you can see that I have added another three layers of brickwork to foundation layers that we have just discussed. I will now turn to review each of the new bricks. Answering these questions will help you identify actions, objectives and new measures in each of the scorecard dimensions. The output is a series of actions need to reach the financial plan objectives. This is called a strategy map. This questioning must be part of your business planning cycle. Omission is a common failing. 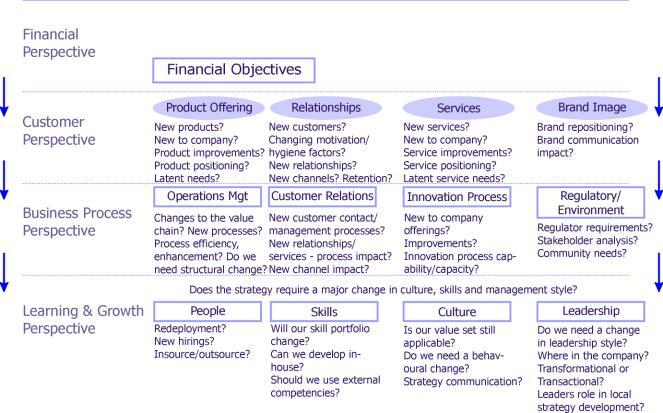 Have you answered these questions and created a strategy map of actions? – Failure to act. The organisation must act when the scorecard shows either positive or negative deviations from objectives. Failure to act, or more importantly, failure of top management to encourage and sponsor action will dent the credibility of the entire process. – Ignoring local performance. Good scorecards, as we have already observed, should encourage business areas to develop their own initiatives and measures. But frequently top management ignore local measures and just rely on centrally devised corporate objectives to assess local performance. Don’t do this – look at locally devised measures when assessing business area performance. If you don’t – especially when looking at compensation – you will undermine the credibility of the process. – Inflexibility. “I can’t do this – it’s not in the scorecard” is a statement you want to avoid. In earlier briefings I have made the point that it is impossible to precisely plan what will happen over say the next 12 months. Organisations need the capacity to respond innovatively to unforeseen opportunities as they arise. There is a danger that use of the Balanced Scorecard may herald a return to the Head Office driven top-down corporate planning process popular in 1970s. Don’t let inflexibility drive out innovation and thought at the business level. At least build a process to amend scorecards to incorporate unplanned opportunities. Or include measures for spontaneous innovation. Don’t allow rigid scorecards to lock innovation out. – Reification. An interesting word. I use it to mean “looking at a picture that doesn’t reflect reality.” A Balanced Scorecard is like a window or should I say two windows – one looking at the outside world and one looking at the inside world. What happens if there are distortions in the window glass or the view is too narrow? It means that as a manager you could be looking at, analysing and making decisions based on a false reality. Make sure that the measures you use really do measure what you want to assess. Reification – the false view of the real world – is a major problem in the Learning and Growth dimension. Many organisations use short questionnaires to assess culture for example. But repeated use of the same questions can lead to cynicism and inaccurate results. The answer? Reassess objectives and measures at least annually as part of the strategy process. But most importantly, don’t just rely upon the scorecard to keep you in touch with employees and customers – talk to them. Remember that reification is the biggest potential danger in using a management tool such as the Balanced Scorecard. – Developing a clear understanding of how strategy is operationalised. – Communicating and more importantly developing a competitive strategy across the organisation. – Encouraging staff locally to develop initiatives to support your organisation’s strategic direction. – Building an holistic view of the organisation and importantly, an early warning system of when things are going right and wrong. – Developing a performance measuring system that spans all levels in the organisation. 1. The concept is embedded in the strategy process. 2. It is the performance measurement system – not one of several. 3. Each unit and function has a scorecard with locally developed actions and measures. 4. It is acted upon. Finally, don’t fall into the reification trap and find yourself looking at an artificial world.